Angelico won with the Fall of the Angels. Australian Suicide replaced Bengala. Moved up a spot. Marvin cheated to beat Zorro. Super Fly attempted to cost Aerostar the title to the Traidor Clowns, but Psycho Clown helped the champs win. The rudos continued to attack after the match (and the Perros walked off instead of making the save), with Argenis running out to help Drago & Aerostar. The tag champs invited him to from a trio with them. 2nd defense. Earlier in the show, Wagner/Pagano/Murder/Monster nicknamed themselves Potencial Universal (a play off the Potencial Mundial nickname for the Psycho Circus.) They may also still be known as the Traidors. Psycho responded to them, and introduced the returning Goya Kong. Monster & Murder ran in for the DQ. 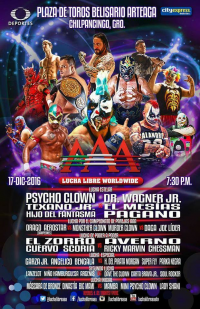 Goya ran in, but also surprise attacked her brother, fouling Psycho Clown. 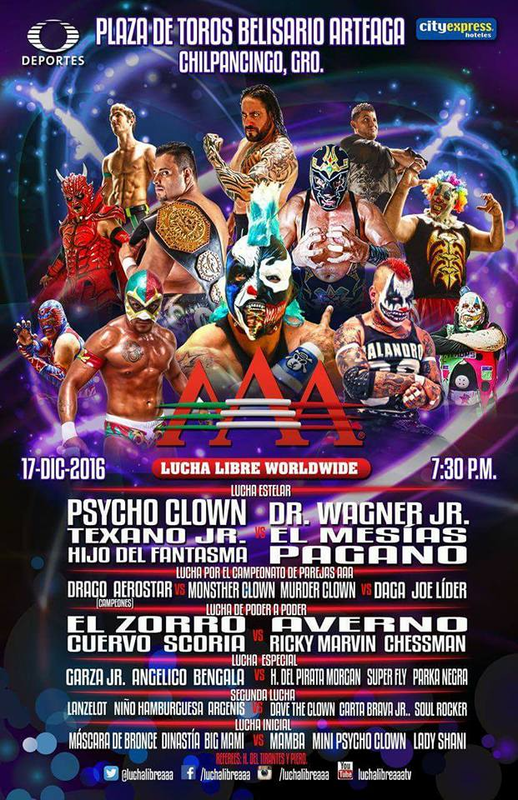 Goya explained she was angry that Psycho Clown was obviously going to embarrass their family by losing his mask at TripleMania.